I think a headlamp should be simple and intuitive to use and operate. I was the only person in camp with a headlamp years ago. Now everyone in camp has one. Headlamps are a must for any outdoor activity in my opinion. I have had my Petzl Tikka for over 6 years now and it still works and looks great! The elastic band has stretched a bit but it adjusts and I can still make it work with a beenie or without. The headlamp kicks out some serious light. It basically has 4 modes. Hi, Med., Low and strobe. The model I have only produces white light. It also has a slide diffuser for a focused beam or a wide beam. The diffuser function is great!! On the focused beam it is almost like a spotlight. If you hold the boost button down it even kicks out more light while you hold the button down. Kind of cool. The headlamp has great battery life. I always use the lithium ion batteries because they perform better in cold conditions and they are lighter. I can easily get a week's worth of solid use out of the batteries. 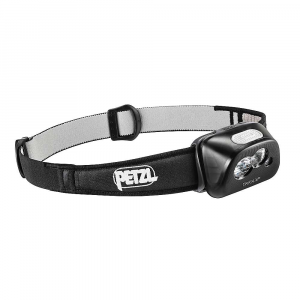 I use this headlamp to read in bed quite often so I know it has good battery life. I try and keep it on the low setting so the battery life is longer. If I go camping for a weekend to 4 nights, I don't worry about carrying any extra batteries. I highly recommend this headlamp. Great piece of gear. Years of flawless performance, still like new. I have used this lamp nearly every day in the house, on the trail, and wherever I have needed a headlamp. I have even used it under my house for plumbing repairs. 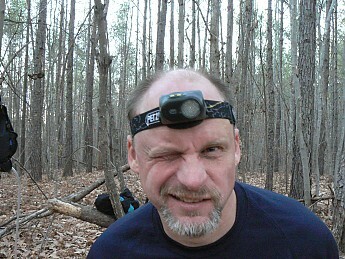 I bought this headlamp in Boone, N.C., in 2005 and I truly do use it nearly every day. Battery life: Very good to excellent. I can easily go on a 3-night winter trip with this lamp and no extra batteries. I also like the fact that it uses 3 AAA's keeping the weight down. The battery life indicator on the side is very handy and when you are wearing it you will get three intermittent blinks when your battery life is about 3/4 drained. Stability: Excellent for a single strap headlamp. This lamp will stay on your head and bounce is minimal even when running. Bright: The brightness is perfect for general purpose backcountry use. I rarely use the brightest setting and almost never use the power boost setting. I use mine mostly on the low setting and can get adequate light for a long time on a set of alkalines. This headlamp is not designed for lithium batteries according to the manual. Compact and lightweight: This lamp is 8 years old, and at the time there was no brighter lamp this compact. It is easily stowed anywhere in your pack or pocket. The switch and the battery compartment cover are super tough and have cycled on and off literally thousands of times. The switch has shown absolutely no indication of wear, it seems possible that this lamp will easily last another 8 years. Summary: Occasionally I look at the latest headlamps available, but am not convinced that there is a better general purpose, lightweight backpacking headlamp on the market. I am perfectly satisfied with this model and highly recommend it. I bought this headlamp about a year ago and so far it has been an awesome purchase. It provides enough light for walking the trails at night as well as setting up a tent in a downpour. So far it has excelled at every task I have used it for. The two buttons are a tad small but I haven't had any real problems with them even while wearing gloves. The boost button is an awesome feature. You can click it on to check while you're cooking at night. The weight is another plus. You hardly notice it on your head. The batteries seem to last forever and the battery life indicator is a nice feature. Overall I would definitely buy the same light again. No questions asked. For years I have been the odd-one out on the headlamp craze, that with their expensive traits, and semi-annoying head straps. However, I feel that as I bought into the headlamp market with the Tikka XP, that it couldn't have been a better choice. This is an excellent headlamp that has plenty of brightness for almost any use (aside from mountain spotlight search and rescue...) and the 3 levels of brightness are perfect for conserving batteries. The "Overdrive" button can also be extremely helpful at times when you really need to see something far off. Unlike some of the other reviewers on this site, I encountered zero problems with the water-sealing on the headlamp, and have changed the batteries multiple times to date with still no water problem (even though I use in the rainy pacific Northwest) The headlamp has excellent battery life, and works great with rechargeable batteries. My absolute favorite about the headlamp, and what makes it a really great deal for me is the awesome "Diffuser" that Petzl incorporated. The ability to switch from Beam to Diffused light is simply a gift, and makes it an excellent late-night reading lamp as well. All in all, great job, Petzl! A solid product that I anticipate not needing to replace for many years. Really, seriously, don't leave home without it. Good battery life, even in cold conditions. Worked fine when wet. I like being able to toggle the diffuser, which I use for reading at home or in the tent, or when a wide beam of light is required (ie changing in the tent). The overbeam helps when you want to extend your range and find out exactly what that strange noise was. A+ product from a quality company and worth every penny. Awesome headlamp. Very comfortable, hard to notice you're wearing it, minus the huge beam of light protruding from your forehead. Used it in the backcountry when reading at night or just going through my pack and organizing my tent and its the perfect solution. It's lightweight, and battery time is great. The lowest setting is very suitable for using it inside your tent. The sliding lens to help spread the beam is awesome, and locks securely into place. The narrow beam and the wide beam are just great. Really impressed by this little light, great product, and I would buy it again if I had to. This is the third generation of Tikkas and each one keeps getting better. Any improvement on the XP will probably mean heavier batteries. 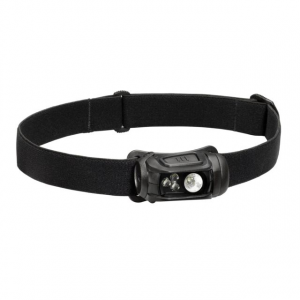 For the size, weight and attributes that this headlamp has, it's perfect. Use the energizers AAA lithium batteries which may be a little more expensive, but considerably less weight and longer lasting, together this combination would be tough to beat. At first I was a bit skeptical of the overall output, that quickly changed. The first thing you notice when opening the packaging is a warning, very similar to the one you see on lasers, telling you not to aim it into your eyes. After putting the batteries into the headlamp and finally turning it on my mouth dropped wide open. The 40 lumen head lamp blows all other similar headlamps out of the water, not only other headlamps but a good amount of hand held flashlights. With my skepticism about output gone I quickly became curious as to the durability of the Tikka XP. I submerged it 10feet in my swimming pool and the lamp never once flickered. Thanks to the rubber O-ring hardly any water got on the batteries. I have also dropped it a few times, not on purpose, and every time it keeps working like nothing ever happened. Overall this lamp is a must buy for any outdoors enthusiast. It is small enough to fit into your pocket and light enough to not cause any discomfort, but most importantly it's bright enough to get you to where you need to go safely. 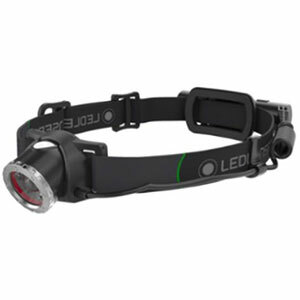 Wonderful, lightweight headlamp. The Tikka XP has the perfect balance of economy and light output. I used it for a 7 hour caving trip on the lowest setting and, when dark adapted (dark adaptation takes the average person about 30 minutes), it was all the light I needed to easily navigate and appreciate speleothems (though there were six of us, three with Petzl Duos). The boost setting does a good job of illuminating big rooms and deep crevices when needed. I used Sanyo 1000 mAh NiMH rechargeable AAA batteries and the XP's battery charge indicator was flashing green at the end of the trip. I plan to try the higher settings on future long trips. The buttons are easy to feel and use, even when wearing gloves. About the quality of the light: It has a focused, square-ish beam, much more focused than my Princeton Tech Aurora. And the light is warmer than the traditional white LED. Whereas Petzl's 14-LED Duo has a bluish beam, the XP has almost a neutral to yellow cast. I may buy a Duo in the future if they use newer generation LEDs, but for now I will stick with my XPs (I have two, one as a backup). Just a terrific headlamp. I have had this flashlight for several years and have had no problems with it at all. It is very small, light in weight, has different light settings and has a way cool boost botton which gives you a hugh supply of light for a few seconds. I would say it to be the best or one of the best flashlights out there. It is kind of expensive, but it is worth the price. Trust me you will love it! Caught this little fella on sale at EMS.com and figured why not give it a shot! Gotta tell ya, it spanks the competition for size comparison versus weight and overall light output! I've always used Black Diamond products for as long as I can remember. From LED to standard bulbs, most units revolve around multiple straps and three or more heavy AA batteries. The XP does the job with three AAA and one strap! You will forget you have a light on at all. With three setting for brightness, a boost that is super handy when extra light is needed, and a defuser to disperse light at your preferences, I'm gonna say this will be a tough booger to beat! I've left the others at the ranch! Bought it for its tiny size, partial power settings, wide and narrow beams. I've had it for several years now. Every summer I spend three or more months in tents, and use it at least half an hour every single day. Batteries last so long that I forget whether I have changed them that season or the previous one. In 2015, this Tikka XP is now "the old model", but still delivering as the first day. All I said, plus its rain and splash proof o-rings. So good and solid...that I forgot it is not thick titanium! So, after a couple of summers I handled the battery cover too roughly and broke off one of its 4 edge-rims. But it still holds! A great flashlight that I can also use as headlamp 50% of the time. I walk around mostly during the day, and though I use the Tikka XP for that a bit, I only need to see 20 metres ahead (60 feet). In lower power setting I use it around the camp site and inside the tent. Plenty of light for all that. Petzl went from being unheard to me, to being a respected manufacturer; I would certainly lean towards buying this model again, or the corresponding version they come up with. Welcome to Trailspace, Hari. Thanks for sharing your experience with your Petzl headlamp. Price Paid: Can't remember. Less than $40 from Cabela's, years ago. I have two of these. They're great, except now having them for years the headbands are all stretched out and I cannot locate replacement bands, anywhere. I do not subscribe to "if it wears out, throw it out." Not to be able to replace a simple part that wears out over time and usage is ridiculous. Shame on Petzl and their distributors. "My headband has lost its elasticity; can I get a new one? Yes, spare headbands are available. Below are the part numbers: - For the TIKKA series of headlamps, the part number is E43999. - The ADAPT headband part number is E00100. - For all other lamps the headband part number E04999. 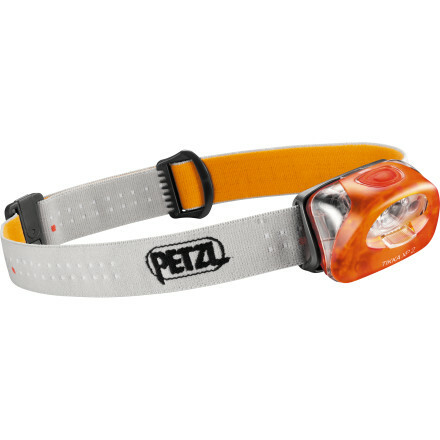 To purchase a new headband, contact Petzl Customer Service at: (801)926-1500. Or check our online dealer list for other sources of spare parts." This item is excellent. You wouldn't need a lamp anymore coz of its very bright lighting, even more stronger than a lamp. It is compact and lightweight and waterproof. I highly recommend this headlamp. So amazing! With the high ouputt LED, the extraordinary boost mode almost turns dark night into bright daytime. Petzl did a good job. An amazing lamp! It's comfortable. It's amazingly flexible in its uses. The batteries last forever. It's also incredibly bright! I found myself sitting on a cliff under a full moon. I switched it to its "spot light" setting and aimed it across the canyon. Its beam was easily visible on the trees on the other side a quarter mile away!...on a moon-lit night! I'll be shelving my gas-powered lamp; why bother with one now that I have a Tikka? I bought a Petzl about 1 year ago and started using it on yacht delivery trips. Slowly cracks started appearing in it around the on off/switch. In the end a large piece fell off and it would not close anymore. I took it back and it was replaced. I took the new one on a trip where it rained a bit. I used it either under a peaked cap or the hood of my rain jacket so it was never actually exposed to rain. After a few days it packed up. I opened it up thinking that the batteries needed replacing and found that it was badly corroded inside and the connections were rusty from water ingress. I took it back. I got a phone call. They said that I had obviously not cared for it well and must have used it in pouring rain or immersed it. Every time I used it in any rain it was under the hood of my jacket or cap. It never had rain falling on it. In spite of this I was told that Petzl would not replace it. In there advertising they say this unit is water resistant yet clearly it is not. I was told that the technical manual says that if it is used in humid conditions it has to be taken apart after use and dried so obviously Petzl do not believe in their own advertising. I look after my gear carefully. After each trip I take out the batteries and leave the headlamp with a silica gel bag to ensure it stays dry. These are very expensive headlamps. I like to buy good gear because I expect it to last and I also expect to get good service from the company. I got neither. For the same price I could have bought 8 cheap headlamps and even if they were as bad as the Petzl I would still have 7 left. It's an AMAZING headlamp. I like MTB and didn't have a headlamp, so I started to search for a good one. I found several brands and models, but one of them repeated a lot in review web sites, TIKKA XP from Petzl. I got interested and I red all reviews. It had only good points and also was winner of some in Backpacker magazine. I decided to get it. I paid more than normal but I´m completely satisfied, with its powerful light and battery ecnom, completely recommended. Light and bright!!! It's a NO BRAINER... Buy one dummy! Best freakin headlamp out there right now in my opinion. Small. Bright. Movable shutter for throwing lots of light on the trail or for looking far ahead. Runs on rechargable batteries due to the voltage regulator circuit, meaning that for overnighters you don't end up throwing away half-used batteries, you just recharge the ones that you used. I have had three generations of the Tikka now -- the original 3-LED one with the clunky non-waterproof sliding switch and fixed lamp orientation, the newer 4-LED one with the waterproof push-button switch and movable lamp orientation (to point close to feet, or far away), and now this one. Each new generation is very slightly larger and heavier but oh so much better for it. Don't worry, the Tikka XP is still light and compact enough that you'll forget it's up there, but now gives big-time light -- especially when you flash the 'overdrive' button! WINNER!!! As soon as I read the Editor's Choice winners from Backpacker magazine I was curious. I had been using an alright head lamp but felt I needed the upgrade. Man am I glad I did! This tiny thing is simply amazing. It has three settings (high, medium, and low) and not to mention the emergency setting wich pulsates the light for help. I rarely ever use the thing on medium or high because low works that good! The front light filter is really the best attribute on this headlamp. With a quick slide, your lighting can go from a long narrow view to a shorter but VERY wide range of view. While in my, tent I lay it beside me to use as my flash light and my whole tent lights up. This is hands down an AMAZING buy for its price. I have to agree with all the other reviews. It weighs next to nothing, is super bright, and the batteries last a long time. The only thing I'm not thrilled about is the AAA bateries. I now have to go out and get some rechargeable ones. I bought it because of the feature and the lightweight design. Beats the dickens out of having to carry a regular Minilite with headband. Great features and long battery usage. The MyoXP may give longer use on the batteries and a little brighter light but I have no complaints. LEDs are definitely the way to go. Petzl has made a winner in my book compared to less expensive brands I looked at and tested. The Tikka XP has been discontinued. 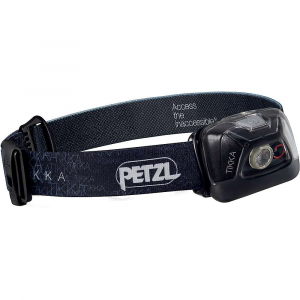 The Petzl Tikka XP is not available from the stores we monitor. It was last seen March 2, 2019	at Moosejaw.